The Regional Maritime University invites applications from prospective candidates for admission into its B.Sc. (Accounting) programme starting in September 2018 on its main campus at Nungua. The B.Sc. (Accounting) programme aims at providing students the knowledge, skills and disciplines essential to enable him them to perform at the middle level of management of the accountancy profession in industry, commerce or academia in the private or public sectors of the economy. The programme also lays the foundation for the graduating student to attain higher academic or professional qualifications for future career development to higher management levels in the accountancy profession and the business world. The programme is for four academic years with each year divided into two semesters. Each semester shall consist of sixteen weeks with fourteen weeks for lectures and tutorials, one week for revision and two weeks for the conduct of end-of-semester examinations. Five courses will be taught in each semester with each course attracting four contact hours of teaching and tutorials. All courses are core. Thus all courses are weighted equally and are given the same importance. Four contact hours have been adopted to give maximum coverage to each course to afford the student the opportunity to acquire as much knowledge as possible. This will help their future career development, especially those wishing to pursue a career in the accountancy profession or attain higher academic qualifications. Very often students writing professional exams rely on low value private tuition. The programme will ensure that graduating students are self-reliant owing to the wide coverage and depth of each course. Students wishing to seek practical work throughout the length of the programme are encouraged and will be provided adequate assistance. a. Senior Secondary School Certificate Examination (SSSCE), West African Senior School Certificate Examination (WASSCE) and General Business Certificate of Examination (GBCE). An applicant applying as a mature candidate must be at least 25 years old, and show proof of age with birth certificate or any legitimate documentary proof of date of birth which is at least 5 years old at the time of application.The candidate shall be required to write and pass an examination consisting of English Language, Mathematics and an Aptitude Test conducted by the University. All foreign and other qualifications beyond the ones specified above shall be referred to the National Accreditation Board for the establishment of their equivalences to determine their eligibility for admission to the University. [iv] All Regional and District Post Offices across Ghana. [b] The E-Voucher contains the Pin and Serial Number required in completing the online form. [c] Access the online form by visiting the University’s online admissions portal at www.rmu.edu.gh/admissions soon after payment. [d] In completing the online form, students will be required to upload their passport size photographs. [e] A completed form is not considered until it is SUBMITTED. [f] Applicants must print out application summary; attach transcripts, certificates and all other relevant documents. These documents should be forwarded to the Registrar. [g] Candidates are strongly advised to visit Courier Companies in their Countries for assistance towards the return of the application documents [see f]. [b] Click on International Applications and follow the instructions displayed on the page for the completion of the form. [c] Applicants must print out application summary; attach transcripts, certificates as well as all other relevant documents and send same to the above address. The closing dates for submission of application forms are Friday, 27th July, 2018 for Mature and 31st August, 2018 for Regular and Weekend applicants. Candidates should note that no application will be accepted after the deadline. Mature Entrance Examinations would be held on Friday, 10th August, 2018. Regional Maritime University is the only regionally-owned (Cameroon, The Gambia, Ghana, Liberia, and Sierra Leone) University in the West and Central African sub-regions empowered to deliver academic and professional programmes for the maritime industry. It started as the Ghana maritime Academy in 1958 as an Institution wholly owned by the Government of Ghana. Then in 1983 the Institution changed its name to Regional Maritime Academy when four other countries in West Africa decided to become part owners of the Institution. 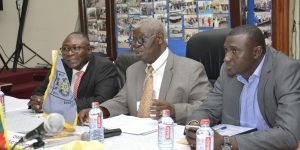 The Institution attained higher status when it was granted full university status with a Charter to award its own degrees in 2007 and appropriately changed its name into Regional Maritime University. The campus of the Institution is located at Nungua. Regional Maritime University is, thus, the only private university in the sub-region owned by five member nations. In 2016 the Board of Governors of the University, realising the importance of business education to the maritime profession, decided to introduce business courses into its maritime programmes culminating into in the establishment of a Faculty of International Business and Humanities and starting with an undergraduate programme in Accounting to be followed by other business disciplines later. RMU organises CILT in collaboration with CILT Ghana.